ST. GEORGE — Two separate incidents of vehicle versus bicycle occurred Wednesday afternoon within two hours of each other in St. George, and a third vehicle versus bicycle incident took place in Washington City Tuesday afternoon. The first of the two Wednesday incidents occurred just before 2 p.m. at the intersection of Red Cliffs Drive and Mall Drive. A gold SUV traveling northbound on Mall Drive had stopped at the traffic light and was about to make a right turn onto Red Cliffs Drive when a man riding a bike, traveling westbound on the south side of the road, collided with the SUV, St. George Police Sgt. Sam Despain said. Vickie Benge was stopped at the same light behind the SUV and saw the incident occur, she said. This was a very low-speed accident, Despain said. Following this collision, St. George Police responded to 700 South in front of Harmons Grocery at about 4 p.m. for another bike versus vehicle accident. A woman was riding a bicycle eastbound on 700 South. As she began traveling across the entrance to Harmons parking lot, a white Ford pickup truck was pulling out of the parking lot about to make a right turn and collided with the bike, Despain said. The bike tipped over into the roadway, and the driver of the truck pulled over and asked the woman if she was OK. After the woman said she thought she was OK, the truck drove away, Despain said. The woman refused medical attention but suffered scrapes, cuts and road rash from the fall. Police officers are looking for the truck involved in this incident and anticipate issuing the driver of the truck a citation for leaving the scene of an accident. A third bicycle versus vehicle accident occurred Tuesday on Red Cliffs Drive in Washington, near the Burger King that is located in the Albertsons grocery store parking lot, just past the intersection where Telegraph Street becomes Red Cliffs Drive. 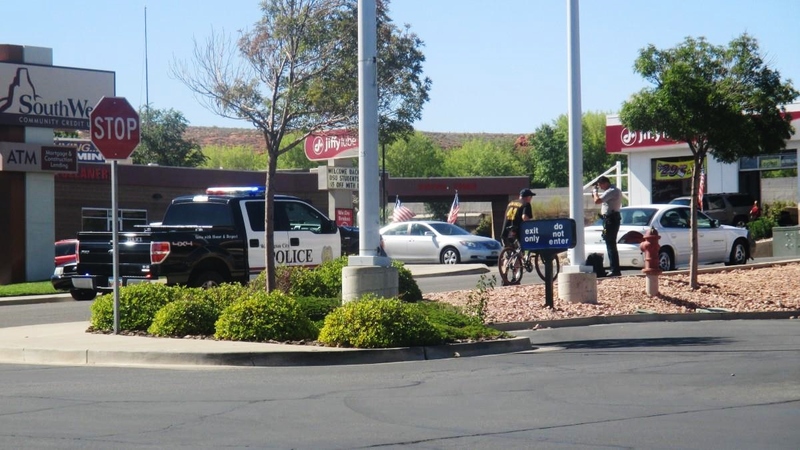 Just before 4 p.m., Washington City Police responded to the incident after an adult male, who had been riding a bicycle westbound on Telegraph Street/Red Cliffs Drive, collided with a white passenger car that was attempting to turn into the Burger King parking lot. Both the driver and bicyclist initially stopped, Washington City Police Public Information Officer Ed Kantor said, but then both began moving forward again and the bike collided with the car. There were no injuries as a result of this accident. “No damage to the car or the bike, no citations issued,” Kantor said. Assistant Editor Cami Cox Jim contributed to this report. All three stories sound like the bicycle is going the wrong way in the wrong place. Bicyclists are bound by the same laws as cars right? going the wrong way with a car would land you a ticket right? The cyclists will be up in arms about how they are not at fault! There was another auto/bike accident Tuesday just after noon at the corner of 450 north and 2900 east in stg. Any news on that one? I wrote this, this morning. After reading the above article it seems extremely relevant. Then they should stay off the road and use the bike trail… roads are build for cars silly cyclist. You’re an idiot. Cyclists have the same right as cars. Some people choose to ride their bikes to and from work. What “bike trails” in this town are you referring to except the park trails? Yep they are legal paths, but that doesn’t make it necessarily right. Ride on it if you want and then there were 4 cyclists hit. You can ride ATVS to and drive a Prius but see how you fare when you are hit with a Buick. I am a cyclist and I agree that all three situations sounded like the bikes were going the wrong direction…depending on the lane they were traveling in. That should be a citation. Not up in arms about that at all. However, drivers and cyclists alike need to be more aware and courteous to each other. Aggressive drivers and cyclists that are downright dumb. Bad combination. Driving on hwy 389 about 2 weeks ago S.O. and I almost hit an idiot cyclist. She was over the white line into the lane. There was a car coming in opposite lane that didn’t want to move over and we moved over the best we could. Still it was very frightening to us. We got some gas at the chevron on the strip. Then a little later we came across that same lady still over the line into the lane. Almost got the lady again. S.O. and I are all for bicyclist rights but, not when they pull stupid stunts like this that puts their lives in danger. Please bicylists please pay attention to what is around you or approaching from behind (like we were) and help yourselves be safer by moving if you are over the white line. If a slow truck or tractor is in front of you and traffic is coming the other way what do you do? You wait until you get clear room to pass. Same rules apply for bicyclist, wait until you have safe passing room then go around instead of pushing us off the road because you are in a hurry. My daughter was hit by a car two weeks ago. The driver received two citations for not keeping his eyes on the road. Now the insurance company is denying to pay for her medical bills and replacing her bike. Here is a story the news should follow up on. That what 30+ years of Republicanism did to America. Can’t we all just share the road! That sounds like a line Rodney King used during the Watts riots in LA a few years back. I am continually amazed at the arrogance of some bikers out there. I have seen bikes going against traffic on the shoulder as if they were pedestrians, and motioning for the cars to either slow down or move over, even though they had MORE than their lawfully required 3 feet of clearance. Not going the right direction, not following rules of the road, not using the bike lane, and having the cheek to tell motorist what THEY should be doing…! Then when something happens, the motorist is usually cited, or the media makes it sound like motorists are just irresponsible. If more cyclists were cited more often for their improper habits, perhaps the roads would be safer all around. Twice I have been stuck behind a bicylist that thought he should be able to ride down the middle of the lane until he felt like he wanted to get over. I’m all for bicylist rights, but gees, I’ve been stuck so many times, and not able to move out of the way of them because of oncoming traffic. It’s almost like they are daring you to hit them. Really bothers me, I don’t want to hurt anyone. And, they should watch for cars coming out of driveways and parking lots, sometimes you don’t see a bike till it’s right in front of you and you are slamming on your brakes. Drivers don’t always have the clear sitelines we should have. I would never ride my bicycle on the streets of St George. Worst drivers in the world. If bicyclists want to be respected they should respect road laws! often times I pull very heavy loads down the road to Gunlock, and come around one of the many corners to find bicyclists 3 and 4 wide in the middle of the road. Contrary to many cyclists beliefs you cannot stop on a dime, especially when you have several tons of weight behind you. I have no problem with a law abiding cyclist; but i sure would like to see some of the ones who think they own the road start to get the same treatment a car or truck gets when the driver breaks the law. I see signs along the road to “Share the Road”. Yet I see cyclists three to four abreast on the road and do not even try to get in single line so the traffic behind can maneuver safely. Cyclists and drivers have responsibilities. Take care of yours and be kind on both sides! The solution to this issue is to bind all users of the road way to the same rules. Bicyclists ought to be cited when they disobey traffic laws, equally with vehicles. I’m an avid mountain biker but refuse to ride on the road unless I have no other option. Ridding on the road makes mountain biking look like a low risk sport. Regardless of what laws are in effect, physics will determine the winner in an altercation, with the vehicle winning every time. I’m all for bikers using the road as long as they understand the risks and are not d….*. That being said plenty of ride drivers around as well. Be safe out there. Maybe we ought to tax bicycles and make them get a license. They use the roads, and they violate traffic laws, as do vehicles and their drivers. If a bike has a licence plate you can identify an offender. Two days ago I was driving on 2000 N and two cyclists just blasted through the stop sign on Tuweap Drive causing me to slam on my brakes. They didn’t even try to hesitate, but rather, wanted to beat me across the road. Problem is, if I have a choice of crashing or hitting a cyclist . . . it would not be much of a choice. What if you were driving through Hurricane and saw some guy riding his neighbor’s horse in the middle of the street? Would you slow down and pass with plenty of space or would you tell your kids to close their eyes and call the police? I am so sick and tired of the cyclists in this area who ride the roads/streets as if they owned them. I agree with those commenters who say they see cyclists riding 3 and 4 abreast and refuse to get into single line and move over so vehicles can go around them safely. 90% of cyclists are courteous and respectful and responsible riders. It’s the other 10% who will flip you the finger if you so much tap your horn at them so they can move over. Not to mention the profanity laced language you will get from these cyclists. Some of you cyclists are jerks and as&*^%#s!! If I were 20 years younger I would show you how to be a REAL jerk and an as*&^%$. To quote a old timer who was a bad a$$ in his youth……”it may be the middle, or the trigger, but I still have a finger that works”. 2) Many cyclists are unfamiliar with road traffic laws that pertain to bicycles. Cyclists and drivers have to work together and be aware of each other for maximum safety – but in the past few days I’ve seen about 4 or 5 cyclists riding the wrong direction, which is just not safe. It caught me by surprise once when I was turning right and all of a sudden, there’s a cyclist headed towards me from the wrong side – I was aware and saw him in plenty of time not to move my car and collide with him, but it worries me how many aren’t aware of this basic principle.